The cover story “A wealth withheld” (September 1-15, 2011) on Joint Forest Management (JFM) revolves around benefit sharing between forest communities and officials, and misses an important point. State forest departments are using JFM committees to extend their control over the communities and divide them. JFM is a bigger threat than Salwa Judum, the Chhattisgarh-sponsored counterinsurgency campaign. In Madhya Pradesh’s Harda district, JFM money has empowered the already oppressive forest department. The department uses the money to employ a few members within a tribal community as watchers and use them to evict others from forestland. For instance, a tribal family in village Unchabarari is not allowed to cultivate on their forestland. Every day about 50 watchers sit on their land to make sure no agricultural activities are carried out. As a result, a big divide has been created within the community. Dyeing industries have extensively polluted the western districts of Tamil Nadu—Tirupur, Salem, Namakkal, Erode and Karur—and the rivers Bhavani, Noyyal and Cauvery. Earlier this year, the Madras High Court had ordered closure of about 700 dyeing and bleaching units in Tirupur over violation of pollution norms. But the pollution continues unabated. A dam, constructed in 1996 on the river Noyyal in village Orathupalayam (35 km downstream of Tirupur), is serving as a silo of toxic effluents from Tirupur and other districts. It was meant to irrigate about 12,000 hectares in Tirupur, Erode and Karur. But even after 15 years of its completion, not a single square metre has been irrigated. The situation in Erode is equally bad. Here, along with textile units, tanneries are adding to the woes of people. Both the tanneries and textile units have polluted a canal called Kalingarayan which was constructed 730 years ago to irrigate multiple crops. This 94 km contour canal (an artificially dug navigable canal that follows the contour line of the land it traverses) starts where the river Bhavani joins the Cauvery and ends at the Noyyal. It was a lifeline for the people in the region, but its water is no longer potable. 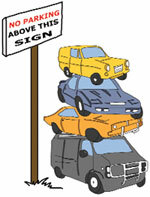 This refers to “Parking that can’t be found” (August 16-31, 2011). The demand for parking spaces in prime areas raises issues of urban planning, aesthetics, market policies and public transport. All these issues are intricately linked, a fact that remains ignored. There has to be a policy on what kind of commercial activity should be allowed when any commercial area is built or promoted. When the commercial premise is let, there has to be forethought about how much crowd commercial activities there will attract and what will be the parking requirement. Space constraint then creates complex situations. The authorities try to set things right by introducing parking charges, building vertical parking places, and if all this does not work, they blame citizens for using private vehicles. On the other hand, indigenous as well as foreign auto manufacturers are encouraged to market their products in Indian cities. We contemplate the growing car sales and then think of demand-supply models. We create a sense of achievement when markets are flooded with all such unnecessary wealth, while the true needs of the city are ignored. We are doing a lot of damage to our cities by giving priority to wrong things. “Good Lord! No trees” (June 16-30, 2011) is a thought provoking article on the ill effects of felling trees to fulfil religious beliefs. The Jagannath Temple in Puri uses timber to build chariots and then dismantles them to supply fuel to the temple’s kitchen. Such religious beliefs should change with time, most importantly with the worsening of the environment. The temple authorities should adopt the systems prevailing in temples in southern India like the Srikanteshwara temple near Mysore. The temple uses good quality hard wood, like teak and rosewood, along with traditional handicraft works to build chariots—a more stable and attractive way. Unlike in Puri, these chariots are painted and preserved for decades by parking them in special sheds. For mass feeding in religious centres like Dharmastala and Siddaganga mutt of Karnataka, solar cookers are used to avoid felling of trees for fuel. I hope the authorities of the Jagannath Temple will explore the alternatives and strive to save the forests. The cover story “The price of mining” (August 16-31, 2011) unmasks the loot of national wealth by the very people who are elected to safeguard it. In schools and colleges children are taught history lessons on how foreign invaders plundered our land. But what about the looters who are pillaging our country today? Bellary is just one case. There are many other places where such loot is going on with impunity. In December 2001, the High Court of Himachal Pradesh cancelled the environmental clearance granted to a private company for its cement plant. The plant was being set near a wildlife sanctuary. Despite the cancellation, the company is acquiring agricultural land from the people with the help of the local administration. 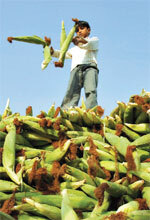 It is true that “Maize Mania” (August 1-15, 2011) would cause shrinkage of acreage of pulses, coarse cereal and rice. Farmers will shift to maize and other cash crops where earning is more. The solution lies in increasing the productivity of rice and other food crops to reach the global standards. This would solve the problem of income of farmers, food security and price rise. This refers to the write-up “2 per cent for social work” (September 1-15, 2011). Some companies are doing excellent work when it comes to Corporate Social Responsibility (CSR). Many others are only displaying it as a top priority. As per guidelines, it is mandatory to do CSR activities but the system lacks proper monitoring. This can be resolved by getting annual reports of companies, including details of expenditure met under CSR. If companies do not meet guidelines, there should be a check on their tax exemptions and other benefits they enjoy by claiming CSR activities with the help of stakeholders. Establishment of CSR trusts at central, state and district levels should be under the control of industry, government and civil society organisations. These steps can help improve the transparency and accountability both in transfer of funds and their utilisation by the companies. This refers to the editorial “Lessons from Kakarapalli” (September 1-15, 2011). While the write-up justly highlighted the problems of residents of Kakarapalli, it failed to explain how power plants around the country have affected the vulnerable sections of society in the name of power sector development. Whether it is in Odisha, Tamil Nadu or Chhattisgarh the issues of forced displacement and deprivation are the same. Society needs to focus on these issues holistically because if it sees them piecemeal the potential devastation may seem like minor inconvenience. The struggle of people living in Kakarapalli is genuine and the sacrifices they are making are invaluable. Halting projects temporarily cannot be construed as the final blow. Vested interests can strike back and influence the people once the wave of protests subsides. Therefore the people have to be adequately compensated. One can take inspiration from the development of mangrove forest by communities in the estuarian areas of the river Krishna in Krishna and Guntur districts of Andhra Pradesh. Similar development can be done in all the estuaries of the country, more specifically in Andhra Pradesh. Concerns of ecology coupled with livelihoods of people have to be kept in mind while formulating different models of development. To maintain the momentum of the development, there is need to constitute new self-help groups and strengthen the existing ones.